The beer, which is also called Super Eight, is a 5.3% ABV gose brewed with eight main ingredients including prickly pear, mango, boysenberry, blackberry, raspberry, elderberry, kiwi and toasted quinoa to which red Hawaiian sea salt is added. 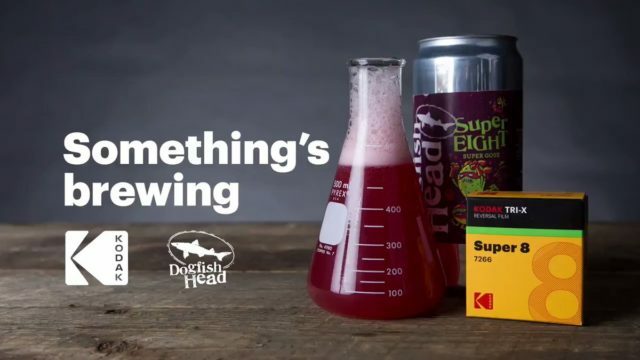 Dubbed an “analog beer for the digital age”, the idea for the brew came about when Dogfish Head founder and CEO Sam Calagione listen to a Kodak podcast on how beer, so long as it has an low enough pH, could be capable or developing film. The beer is described as vibrant red in colour is being released across the US in 12oz cans next month. Kodak has also published instructions on how to develop its film using the beer. You must first add 500ml of the beer to a container, then heat the liquid to 32 degrees celsius. Take off the head and add 12g of vitamin C, stir then add 50g of baking soda and stir again while the liquid foams up. Wait until the liquid settles, then turn the lights off. Pull the exposed film out of its cartridge and place in the container fully submerged in the liquid. Move the film around with your hands for 15 minutes. Then transfer to a stop bath in a separate container for 30 seconds to a minute. Then transfer the film to a container with fixer in it for a further three to four minutes. Then turn the lights back on, wash the film in cool water and leave out to dry. The brewery is also going to be producing a film with Kodak in the autumn, process using its beer, releasing it in partnership with the Nature Conservancy. A preview can be viewed above. Bit early for April Fool’s isn’t it? !